CHICAGO, IL--(Marketwired - Nov 18, 2014) - According to the US Fire Administration*, holiday cooking accounts for 41 percent of all residential building fires in the month of December. Heating fires follow at 28 percent and open flame fires at 9 percent. With more cooking, decorations and open flames, the risk of house fires and burns increases drastically during winter months. 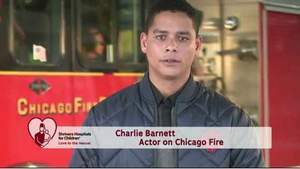 To help families "Be Burn Aware" this holiday season, Shriners Hospitals for Children® is joining forces with actor Charlie Barnett of NBC's popular television show Chicago Fire. As the newest Love to the rescue® Ambassador, Barnett will participate in public service announcements and other activities to let parents know what they can do to reduce the risk of house fires and burn injuries this holiday season. "Working closely with the fire fighters of Chicago, I know a fire can turn a family celebration into tragedy within seconds, especially when there are young children in the home," said Barnett. "Shriners Hospitals and I want to make sure parents know what they can do to keep their homes fire safe and kids burn free." Turn pot handles toward the back of the stove so children cannot reach them. Keep a lid or cookie sheet nearby to cover a pan if it catches on fire. Water trees regularly. Discard when dry. Keep trees away from heaters and flames. Discard lights with bare wires, frays or kinks. "A serious burn or scald can be a life-altering injury with an extremely painful recovery, especially for a child," said Dale Stauss, chairman of the Board of Directors for Shriners Hospitals for Children. "We want to do everything we can to reduce the risk of children sustaining burn injuries. Working with Charlie Barnett to prevent house fires and burn injuries is just another way we send Love to rescue." Visit BeBurnAware.org for additional tips to prevent burn injuries, activity books for children and educational materials for the entire family. Charlie Barnett is best known for his role as Peter Mills on the hit NBC show Chicago Fire. Barnett's love for acting began when he was 7 years old and began performing in multiple opera and musical theatre productions in Sarasota, Fla. After high school, he was accepted into the prestigious Juilliard School and continued to perfect his craft. Upon graduation, he appeared in Men in Black 3, Law and Order: SVU and Law and Order: CI.